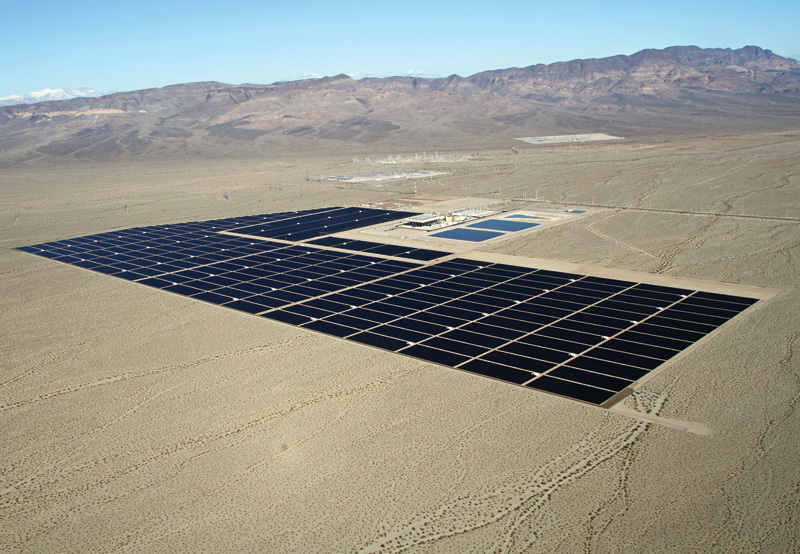 Sempra Generation has moved into solar power in a significant way, having recently completed the largest photovoltaic solar project in the U.S.—the massive 48 megawatt Copper Mountain project in Boulder City, Nevada. California-based Sempra Generation is getting into solar power in a big way—and quickly. In 2007, the company was considering adding renewable energy to its portfolio, and this past December, it completed the Copper Mountain Solar project, the country's largest photovoltaic solar power plant. Located in Boulder City, Nevada, it produces 48 megawatts from 750,000 solar panels spread out over 380 acres. The solar project began as a 10 MW pilot project in 2008. Sempra used First Solar as the contractor and sold the energy to one of California's utilities, Pacific Gas and Electric. "Pacific Gas and Electric was interested in buying more solar from us, and we had enough land at this site to put on an additional 48 megawatt project. So we ended up signing an agreement to sell them that power for 20 years," says William Engelbrecht, vice president of planning and construction with Sempra. 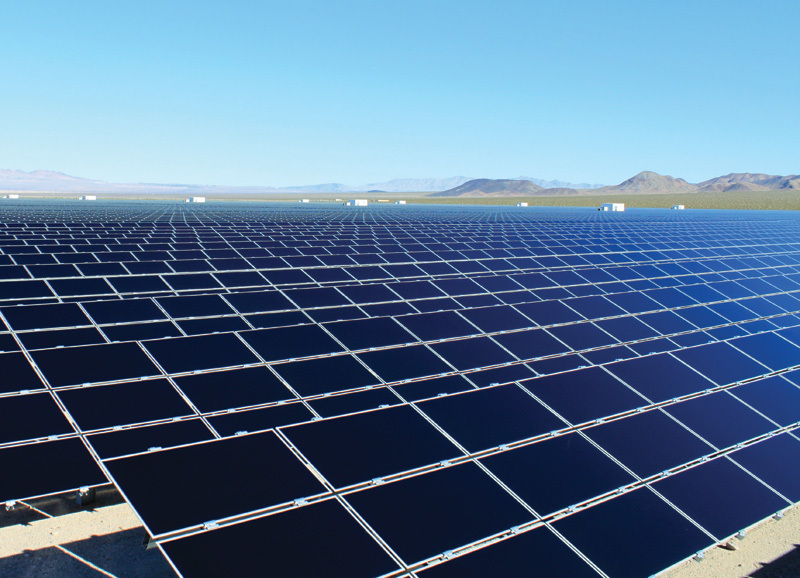 Sempra again turned to First Solar as the contractor for the large-scale project. Luckily, since Sempra had already leased the necessary land, and because Boulder City had a "solar zone" in place, permitting went quickly. "We started construction in January of 2010 and finished in December of 2010," says Engelbrecht. "It was a massive project to install in less than a year's time, and of course, the most important part of the project was the safety aspect." Safety comes first with every Sempra project, he says. "With a project of this size, getting every worker home each night to their family is our key priority," says Engelbrecht. To the average person, putting in a solar facility wouldn't seem like a particularly dangerous endeavor. But it's the repetition of tasks that can lead to safety issues. "We put in over 100,000 steel posts, and on each post, we had an angle bracket, and then on each angle bracket, we had a table, which is effectively the structure that supports the portable panels. Once the table is on the angle bracket, the panels go onto the table," explains Engelbrecht. "As you can imagine with around 750,000 of these panels, it can be a very monotonous job. The safety hazard is that people become robotic." Throughout the project, if any safety issues arose, they were dealt with immediately. For example, when it became apparent that workers were getting small cuts on their forearms from lifting panels out of the shipping crates, longer gloves were used so the glass wouldn't touch their arms. "Between Sempra and First Solar, the safety record was outstanding at this project," says Engelbrecht. "In fact, based on safety metrics, this project achieved a world-class safety record." That's also quite an accomplishment when you consider there were approximately 350 workers on the site at the peak of construction. Sempra and First Solar have another reason to be proud—Copper Mountain Solar was chosen from over 200 applicants to receive a Solar Project of the Year award. Engelbrecht says there were a number of reasons they were chosen. "I think they saw our safety record, the size of the project, and also the speed in which the project was built." That speed was a result, in part, of a lot of pre-planning between Sempra Generation and First Solar. It was also the result, Engelbrecht says, of timely deliveries. There wasn't a lot of on-site storage, and First Solar held panels at their production facility in Malaysia and delivered them as needed. It was a lot of deliveries but allowed for a steady flow and quick set up." Accessibility also played a key role in Copper Mountain's timely construction. "Because we have a 480 MW gas-fired combined cycle plant right next door, the infrastructure was already there as far as the roads and everything else," says Engelbrecht. "If we were developing a new site, we would have had to spend a little more upfront time putting in that infrastructure." Even small challenges like turtles didn't slow up the crew. The project was going up in the middle of a desert, and turtle fencing was required to keep the desert tortoises out during construction. The Copper Mountain solar project is made up of 750,000 solar panels spread out over 380 acres. The massive project was completed in less than a year's time, with construction starting in January 2010, and the project completed in December 2010..
"Even with the turtle fencing, we still had five tortoises come onto the site," says Engelbrecht. "We had it pre-arranged with a local group to come pick up those tortoises, if we found them, and then take them to a new home." That's another safety consideration, he adds. "One of those safety things we talk to every worker about is being aware of critters." Every time a company builds a project, it's partially a learning experience. It was no different for Sempra Generation and First Solar. They applied lessons they learned from the 10MW pilot project to the Copper Mountain plant. For example, to avoid bottlenecks on this project, First Solar brought in more, and smaller, post drivers than were used on the 10 MW pilot project. And instead of constructing tables on the site, preassembled tables were delivered, straightened, and placed on the angle brackets. The changes weren't large, but they added up to create better efficiencies, a safer working environment, and ultimately a more profitable facility. "And, of course, what we learned on this project we'll take to the next," says Engelbrecht. Incentive packages, coupled with Boulder City's unique zoning laws, made the project possible. Sempra was able to attain some tax abatements through the State of Nevada. Also a big help were the federal tax credit and the investment tax credit on the construction. But it's Boulder City's "solar zone" that set the project apart from others. Boulder City had land unusable for other development. The desert land receives 330+ days of sun, is accessible to transmission, and is tailor-made for solar power. Recognizing the solar resource in their backyard, the city created a solar zone as an incentive to build solar farms. Boulder City also made themselves a valuable partner. "The town is exceptionally great at communicating; there are no surprises, and they're genuinely interested and enthusiastic and want us there, and that makes a huge difference," says Engelbrecht. "In addition, Mayor Roger Tobler is extremely supportive of projects like this. It made a big difference having the mayor behind us with such support." Sempra now has a 20-year contract with Pacific Gas and Electric for the facility and the 10 MW power plant, but it won't be the last contract. "We're about to start construction on a 150 MW project in Arizona, and that power is also going to Pacific Gas and Electric," says Engelbrecht.Yes, you heard right—150 MW. That's enough wattage to power over 56,000 homes. Sempra is preparing to break its own record. This is just the start. Sempra Generation is ready to embrace solar on a large scale. "We have well over 1,000 megawatts in our solar pipeline of projects we're developing," says Engelbrecht. "Our Mesquite project—the 150 MW project in Arizona —is simply phase one. The site is actually large enough to accommodate 600 to 700 MW of solar. "We have a site up in the Antelope Valley north of Los Angeles that's capable of 200 to 300 megawatts, and we're looking at other sites around California, Nevada, and Arizona, and in total we're well over 1,000 megawatts of new development in our solar pipeline. You could say we have the solar bug." Solar is still more expensive than coal or gas, but that doesn't dampen Sempra's optimism about the solar future. "Solar has no emissions, and solar costs have dropped tremendously in the last 10 to 20 years," says Engelbrecht. "Every time we put in one of these facilities, we learn more, we bring down the cost of the panels, and we bring down the cost of the infrastructure that supports those panels." Sempra also sees the nation embracing renewable energy as well. "California now has a 33 percent renewable standard that needs to be met by 2020, and Arizona and Nevada and other states in the west also have renewable standards, so there's a large demand for our product," says Engelbrecht. "We know how to build a good product, and we're just developing sites and effectively meeting consumer demand." With every facility, Sempra is paving the way to an affordable solar future.